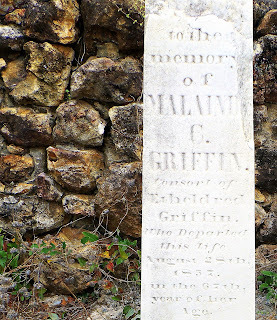 When conducting a cursory look into the life of Etheldred Griffin (how could I resist when presented a name like that), I found several online family trees and an entry on FindAGrave. Every link I clicked, however, said his wife's (consensus states her name as Malinda Burton) burial location was unknown or lost. Did I stumble upon it? Frankly, I don't know for sure. The stone I found in Walker Cemetery (Bleckley County, Georgia) is not so easy to read. It appears the last letter of the first name is missing due to, well, who knows for sure. Possibly erosion, but it's very likely the stone visible today is only a partial of the stone originally placed. If the last letter was an A, the first name would look to be Malainda. The next line states this Malaind[?] 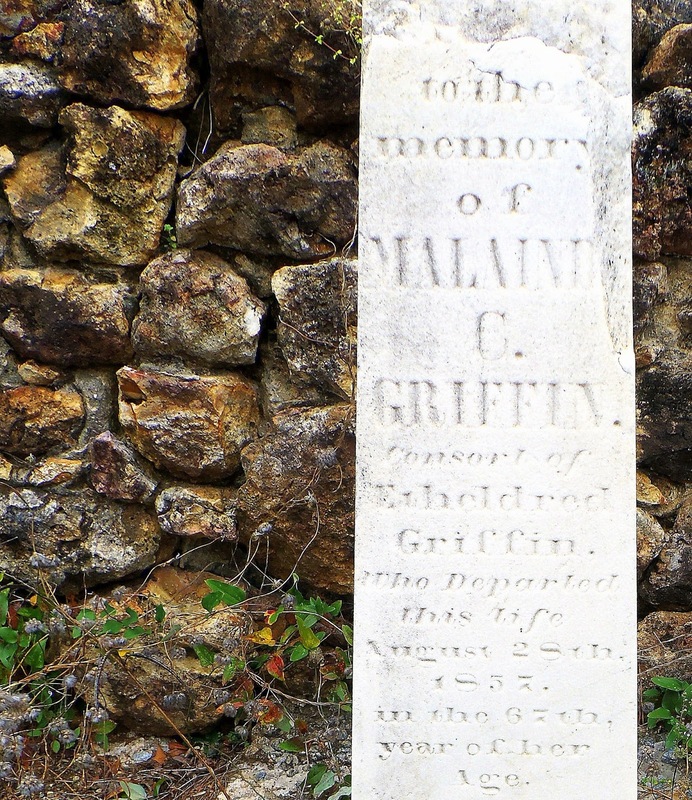 was a consort of Etheldred Griffin. This could mean wife, but could also simply mean companion. I am able to locate Etheldred in the 1830 and 1840 U.S. census for Twiggs County, Georgia. Twiggs is next door to Bleckley (which was created in 1912 from Laurens and Pulaski counties), so that's not a far stretch. Too bad I didn't find them in 1850. I found only a couple of references to Malinda's birth and death dates. A birth year given was 1795, and a death year given was 1833. That doesn't exactly jive with the dates of about 1790 and 1857 given on the stone I found. 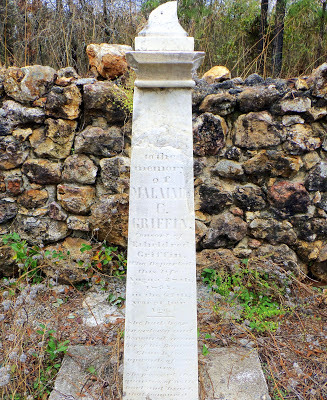 I don't know if I did or not, but it would be pretty cool if I stumbled upon the "lost" burial location for Malinda Burton, wife of Etheldred Griffin. Maybe someone will stumble upon this blog post and let me know if I'm crazy or not. Photos © 2013 S. Lincecum. 'consort' was sometimes used for a woman who died before her husband; it didn't carry any negative connotations. 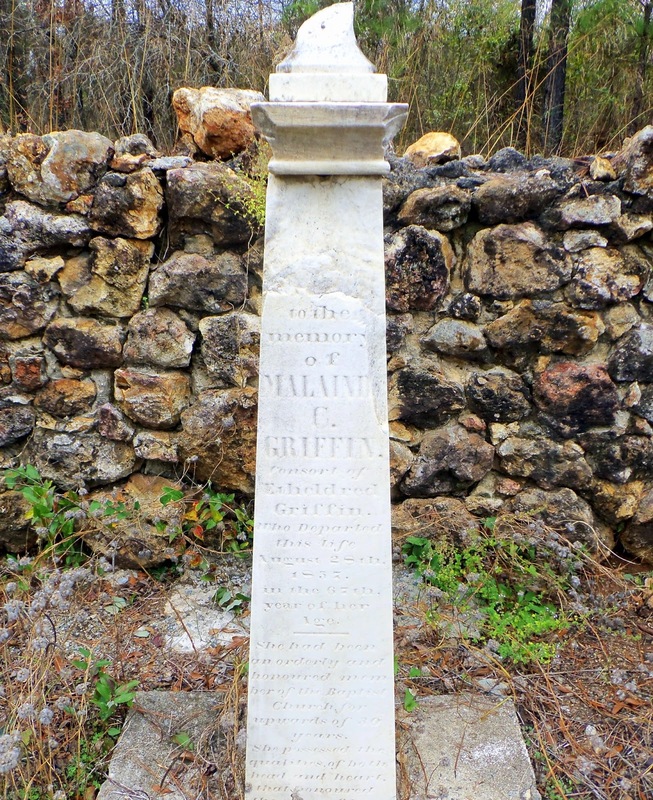 Mrs. Malinda Burton Childers was the wife of William Etheldred Griffin. My info says they were married in April of 1835. Congrats! I think you have found her. Cool. There's also a Richard Childers Walker (1832-1859) buried in the same cemetery.